I've been playing a lot of Kerbal Space Program lately. I've launched quite a few "half-failed" missions where my craft will get to where it's going, or very close to it, only for me to realize that it doesn't have enough power to get back. Most of these missions are now roughly analogous to the real-world problem of dysfunctional or retired satellites which remain in orbit as space junk. However, I've found that the majority of my space junk problem (not really a problem just yet, but I'm sure it will be eventually) isn't with these missions. 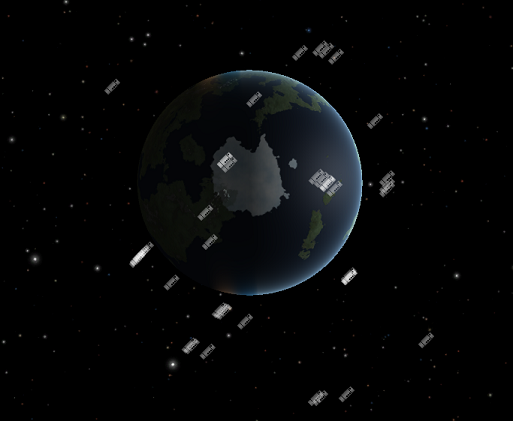 Most of my space junk is from spent rocket stages that were ejected, and now remain, in orbit or on exit trajectories from Kerbin (the Earth analogue in KSP). Here's a shot of Kerbin, looking at the south pole, which shows many of the 65 trackable items currently categorized as "debris". All of these are upper stages that were discarded from previous missions - actual flyable (albeit perhaps un-fueled) spacecraft and probes are categorized separately. In considering how I'd clean up this mess, now that I've obtained the "Advanced Grabbing Unit" (effectively a big claw I can put on a spacecraft to grab stuff, e.g. so I can bring stuff down from orbit or re-direct it when it lacks its own power) I realized that any missions I'd launch to clean up this junk would probably just end up creating more in the process. After all, I'd need a lot of fuel and power to get back up there in the first place, and to get around once I am, and eventually I'd end up wanting to drop off empty components in orbit again. This got me to thinking a little less about cleanup, and more about prevention. So, I'm wondering if this is a significant consideration in the design of real-world spacecraft. Do real-world space agencies and commercial providers make any special efforts, when designing their rockets, to make sure that most expendable stages (not just reusable ones, like the Space Shuttle SRBs) are returned to Earth instead of being left in orbit? Is any consideration given at all to stages which would be discarded on an exit trajectory from Earth? (e.g. : Try to get them captured by the sun or another Sol-based celestial object, instead of leaving them to fly out where they might eventually impact some distant civilization.) Are there any common design methods or technologies that are specifically intended to address this issue? Some early upper stages would maintain residual fuel/oxidizer in the tanks after they were done. Over time, they would explode, causing large debris fields. Most nations who can launch agree to vent propellants from upper stages that remain in orbit or try to deorbit them when practicable. An upper stage used to launch to GeoSync is much harder to deorbit than a LEO upper stage as you might imagine. But upper stages to GEO often have a very high apogee, with a low perigee, so the perigee can often take them back through the atmosphere for reentry. There are currently International NASA requirements on near earth and interplanetary/lunar upper stage disposal. I can't find a database for all the near earth upper stages, but Stratcom (US airforce) is tracking all space junk near earth and warns spacecraft operators of impending conjunctions. Here is a paper from ULA (atlas and delta launchers) on the topic http://www.ulalaunch.com/uploads/docs/Published_Papers/Supporting_Technologies/Orbital_Disposal_of_Launch_Vehicle_Upper_Stages_final.pdf . For higher energy orbits the upper stage is disposed into a heliocentric orbit (around the sun). There are international agreements on "planetary defense" so as to not contaminate planets/moon that may have life. In the later Apollo missions, they hit the moon on purpose with spent upper stages to cause lunar quakes which were measured by seismographs installed by the astronauts. Apollo 12's upper stage missed it's disposal target and showed back up near earth decades later (https://en.wikipedia.org/wiki/J002E3). Not the answer you're looking for? Browse other questions tagged debris or ask your own question. Have there been any documented mini-moons since 2006 RH120? Regulation governing the use of ocean areas for the return of space objects?